What happens when an easy-going guy gets into trouble with undercover cops, a jealous gangster, and a beautiful girl at a tough Los Angeles alternative school? It’s what happened to David. 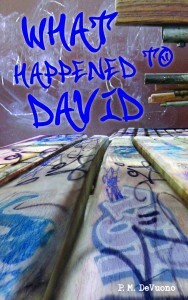 What Happened to David provides a new twist on what it’s like to be bullied. It tells the story of what it’s like to stand up for yourself and then get sent to an alternative school because of it. In What Happened to David, 15-year-old Mary is victimized by an obsessive, love-struck teen gangster and then sent from a magnet school to a tough alternative school where she meets David, another victim of an unfair system. While reflecting on stupid car thieves, bad tattoos, and other foolishness, as well as the hard luck stories of the students around them, David helps Mary to view herself and her new school as an opportunity – an “oasis of second chances” – rather than a punishment or an embarrassment. Their love grows as they adapt to their new school. Just as she starts to feel safe, Mary’s past returns with tragic consequences. This is a story about young love, obsession, belonging, violence, survival at school and coping with tragic loss. It’s a fast paced, easy read (8th grade level), with enough menace, action and goofiness to keep struggling readers interested and enough depth for advanced readers and protracted discussion. Although this is a work of fiction, it is inspired by my 20 years of teaching a tough alternative school much like the school in the story. Too many kids hate to read. This is especially true at alternative schools. They struggle with reading and give up trying because the vast majority of books don’t relate to their world. So I wanted to write a book about them for them, and I did. What Happened to David fills a void on our library shelf. Taking place in an alternative school, What Happened to David has more gangster edge and violent craziness than many teen series yet it has a sweet love story missing from the extreme street scenes of books that are only about gangs. For more details see A Conversation with P. M. DeVuono. I believe in this book, my students did too, and they were the first to read What Happened to David. Educators, parents and kids will find this book helpful as well as entertaining. Follow What Happened to David on Facebook. I really identified with this book because of my experience dealing with the expulsion process and going from a regular high school to a continuation. The characters in this book reminded me of the many people I met while attending an alternative school. It also brought back memories of all the awesome teachers that would teach those that were labeled unteachable. I recommend this book to everyone especially parents because it brings awareness of situations that occur in school. Very eloquent Juan. Thank you so much! Two Thumbs up! Can’t wait for the next book! I am so going to buy this book! Congratulations on your book Devuono. Thanks Crystal! So good to hear from you. You are an excellent writer and these are “real” stories. Your book is a fast paced, sometimes funny, sometimes tragic, inspirational perspective on high school, love and loss. This is a beautiful book in the tradition of “West Side Story”. I couldn’t put it down. The characters are engaging and realistic. The message is poignant and tragic. As a teacher, I have worked with students who have suffered from bullying, and lived in fear. David’s character displays a wisdom beyond his years. This is a must read for teachers and middle-high school students. Mr. DeVuono is a talented writer. Write more!